ひなまつりを楽しみました　We enjoyed Hina festival. March 1, 2019 We enjoyed Hina festival. 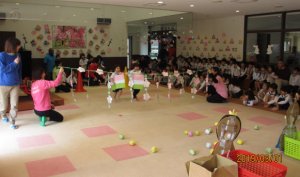 After highlighting the Hina doll crafts each class created, we sang “Ureshii Hina Matsuri” together. Following that, we played a game in which “hina crackers” were fed to the Hina dolls. 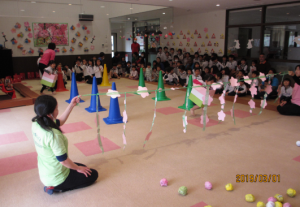 For this game, children ran wearing “hishi mochi,” used the “hishi mochi” like a baton to pass to the next child, and had various obstacles in the way. The rules were different depending on the age group, so we were all able to enjoy the game. Cheering for the children was also very enjoyable.